David Morris sent along these photos of Maine Northern 9801 from Saturday. NB Southern ran several trains out to Renforth Wharf in Rothesay, NB and back to carry people to and from the Saint John Dragon Boat Festival, like they did in 2009 and I think in 2010. As you can see, it was quite foggy. I believe all of these photos were taken at Harbour Station. Passengers board NBSR 5448 and the other cars. Thanks for the photos, David! Ron Tilley posted a series of photos he took in Maine in early August 2011. 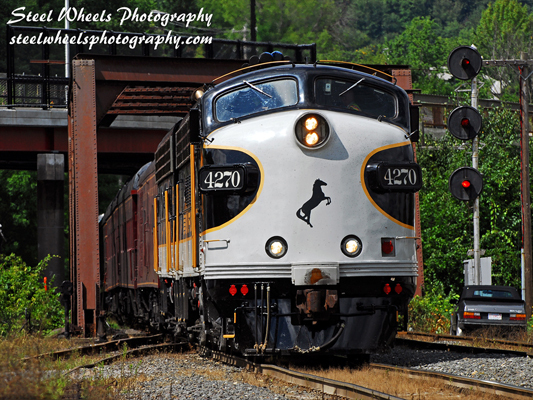 They feature the new Maine Northern operations, with NBSR locomotives, leased HLCX 911 and even leased MMA 2000. There are also shots of the Montreal, Maine & Atlantic (MM&A) on the remnants of their track. I encourage you to go see the album. In other news, I believe this is post #2,000 for me on this blog. I started this in July 2005 and have been plugging away ever since. Thank you for being along for the ride and we'll see you at #3,000 and beyond. Norfolk Southern ran a business train through New England recently and Kevin Burkholder did a three day chase to document it. You can read about his adventures on his blog. He chased the trains through New York, Vermont, Massachusetts, and Maine. Kevin is selling prints of the occasion here, and they look gorgeous. I encourage you to read his blog as he does some great photography. Brian Barchard sent along a few shots of Maine Northern Railway #9801 in McAdam. He spotted it there on the afternoon of August 20 (Saturday). They came into McAdam with a bunch of empty log cars. After dropping them in the west yard, they wyed the engine, and presumably left. I guess it came back to McAdam a few days later, because Gary Lee shot it there on August 23. It looks like it was coming off the wye. Brian also mentioned he saw CN 4102 heading west through Harvey toward McAdam on the evening of August 21. As it turns out, Gary was out and saw it shunting the yard in McAdam that night. CN 4102 has been working in Saint John. Kevin Gaudet caught it and CN 4132 as part of CN 406 on June 11 heading to Saint John. Matt aka Saintjohnrailfan shot the same train in Hampton, closer to Saint John. Good railfan coverage all over! When I was in Regina, I had a look through the good old Trackside Guide looking for interesting things to see in the area. I noted that Evraz Inc. had quite a selection of industrial switchers, so I spent some time there in the morning of August 5. Evraz has a large facility just north of Regina on Albert Street. They basically fill a square bounded by Pasqua Street to the west, Albert Street to the east, Sherwood Road to the north, and Armour Road to the south. They are served by CP off the CP Lanigan subdivision, which runs right next to their facility. Click on the map to see it in Google Maps. When I arrived there, I saw an orange switcher pushing some gondolas down a spur track. I waited patiently at the Pasqua Street crossing until it came back. It was engine #11, a GMD SW900 built in 1955 as CP 6716. I found this little video, shot from the same location I was at. Another switcher was active, #5, an EMD NW2 (!) built in 1949 as Great Northern #156. It did not venture out of the property but I was able to get a few shots with the long lens. Note the homemade #582 on the freight car. It was pulling a string of those cars. I think that is a track scale in the foreground. After that, I drove around trying to see more of their switchers. I started down Industrial Drive and met an SUV coming out of the facility. He waved me over and asked if I was "the gentleman taking pictures of our facility." I said, yes, that is me. He asked me very politely what I was photographing, and I told him that I take pictures of trains and I was shooting their locomotives. He asked if I was going into their facility, and I said, "no, of course not!" He said OK and was on his way. That's how a challenge like that should go. Plant security has an obligation to go question suspicious people, and there's no doubt I was doing something out of the ordinary. I was being very obvious about what I was doing, not skulking about, and certainly not trespassing. Some might say I was within my rights to say nothing, or to challenge him back, but what would be the point of being belligerent? He'd probably call the police and then I'd have to talk to them. Better to be up front about what you're doing, and 9 times out of 10, they'll nod and be on their way. After he drove away, I got out and shot a few of their stored locomotives from Industrial Drive. Clearly they are being parted out. I also saw #10 (in BN green) but didn't get any decent photos of it. #6 and #8 might have been there or they may have been scrapped already. Wheat City Metals is co-located with Evraz, and they deal in scrap metal... like old Government of Canada grain cars! I hope you enjoyed this little tour of a big place! Walter Pfefferle aka Railpast continues to take great shots... witness this nice one of SOO 6045 leading a train over a bridge near Woodstock, Ontario. I think Walter likes SD40-2s, because a lot of his CP shots feature those units leading. Maybe he's just luckier than I am. I usually get toasters. Look at this, an SD40-2 leading a red barn! Of course Walter shoots more than just CP. He's out there proving that the Coors Light engines are alive and well. I understand VIA 6445 (formerly the lead Coors Light engine) is rattling around between Toronto and Montreal. Finally... Alcos doing what they do best. Check out Walter's site. Also have a look at his videos! August 16 was a busy day of CN watching for me. I started in the morning by driving to Wilkes Avenue by the Perimeter Highway, a little before 8 AM. An east-facing container train was parked on the north track on top of the hotbox detector at mile 10. I went to the head end and saw CN 8910 was the sole power there. This turned out to be CN train #112. Incidentally, this is my first HDR photo. I took three shots at different exposures and used FDRTools Basic to blend them together. I'll talk more about HDR at another time. As I was taking shots of 8910, I saw a headlight to the west. After a few minutes, one of the crew from 8910 dismounted to do a rollby inspection. Dual SD75I engines CN 5795 and CN 5688 at the head of train #404 rolled by on the south track. I didn't get a really good shot of the actual passing move but here's train #404. Remember that engine number CN 5795. Satisfied, I started walking back to my car. As I walked across the tracks at the Charleswood Road crossing, I saw another headlight to the west. I trotted back and took a position to record this new train. I forgot to record this train #. I think it was a 7xx series train. It had SD75I CN 5705 and Dash-8 CN 2407 for power. That was all that I could see for the time being. I heard of some kind of "traffic tie-up" around Fort Rouge but I wasn't going to go investigate. I headed east on Wilkes, only to find the CEMR train sitting at the end of their track at Carman Junction. They clearly weren't going anywhere, so I grabbed a few shots and continued on. I saw one more train! CN #115 was waiting just east of Shaftesbury Boulevard. CN 8811 and CN 8005 started rolling after a few minutes, so I shot them as they passed. I heard CN #112 finally getting permission to continue on at this point, so 115 and 112 probably met somewhere near Carman Junction. That was it for the morning... four CN and one CEMR trains in an hour. Not bad. On my way home, I headed out via Wilkes and saw CN #301 heading out. It had a single engine for power... the same CN 5795 that came into Winnipeg on train #404. I first shot the train at Carman Junction. Note the signals behind the engine. I chased west and shot video train 301 a few km east of Diamond. Check the video out... especially the end of the train! Yes, that is the Herzog multipurpose machine HZGX 185 that I saw back in February. I think this must be approaching some kind of record for largest # of cars pulled by a single engine on a road freight... 134 cars plus the Herzog set. David Othen's books are on sale now, along with any other books on Blurb. Buy two or more books from one author and get 20% or 25% off with offer code VALUED. I was in Regina, Saskatchewan a few weeks ago on vacation. I had a chance to get out and see trains a couple of times while I was there. On August 5, I visited the CP yard downtown as well as the CN yard off 1st Avenue. Photography is difficult at the CP yard so my shots are basically through the fence and not worth posting. Since CP's main yard is in Moose Jaw, the Regina yard is pretty small and doesn't have a lot of engines hanging around. There was a collection of GP9s, GP38s and an SD40 there, as well as an American crane. Things were a little more interesting as I approached the CN yard. I was heading north on Winnipeg Street when I saw a four engine CN set at 1st Avenue. CN 2200, CN 5640, CN 4792 and CN 4797 were by themselves there. In retrospect I think they ran light from the CN yard and turned on the wye. I saw them heading for the CN yard so I gave chase. Fortunately they were running slowly and I got ahead of them, and shot this video as they crossed Broad Street. I went to my favourite viewing spot, atop the berm at the north end of Connaught Street. I drew it in dark gray in the map. Standing on top of the berm, you usually can see the whole yard. Unfortunately, a large string of grain cars was blocking the view the first time I was there. I returned later and got some decent shots from the berm. One of my favourite engine types was present, with GMD1 CN 1439 parked near the crew building. Two GP38s were also present, CN 4795 and 4790. Old black caboose CN 79543 was there as well. I saw the graffiti "artists" have been vandalizing it. I last saw this caboose in August 2008. I'll post more about my Regina sightings later, including some interesting industrial engines. This is the Lehigh Heidelberg Cement Group facility in south central Winnipeg. It used to be called Inland Cement until whatever series of mergers resulted in the current owner. This is served by CN's spur off the CN Rivers sub just west of St. James Junction. The same spur also serves a local plastics company and jointly (with CP) serves the LaFarge facility. See the map below. Inland Cement is a good CN customer and gets a lot of shunts in a week. Typically CN uses a GP9 and a slug to do the shunting in the area. Inland has a car mover to push the train cars around in its facility. Incidentally, the new IKEA is going into the field just north of Inland Cement! I was sent this link full of cool photos. These are pictures of actual trains that look like model trains. How is this done? It's called a "tilt-shift effect". It can be done optically with a special tilt-shift lens, or during post-processing with Photoshop or other software. Essentially what you do is take a photograph, preferably taken from well above "ground level", and blur most of the photo except a small portion. This simulates the very shallow depth of field used in most macro (close-up) photography. Also the colours are saturated to simulate the brighter paint of most models. Here's a web site devoted to tilt-shift photography. There is even a tilt-shift maker online to do it all for you! and turn it into this one! I was out near Diamond again on August 2 and caught a couple of trains. First up was CN 199, coming out of the rising sun just after 8 AM. Half an hour later, I had to go, but before I left the area, I drove all the way to Diamond and saw there was a CN freight parked west of Diamond. I went to investigate and saw it was a general freight with four SD75 units - CN 5643, CN 5637, CN 5651 and CN 5701. There was a crew onboard so I don't know why they were staying there. Here you can see the whole train curving off in the distance. That was all well and good. I was out again just after noon and I found a CEMR train on the south track just east of Carman Junction. I presume they had just pulled onto the CN Rivers sub and the train was waiting for the conductor to catch up. After he boarded, off they went. CCGX 5232 and CEMR 4001 provided the power. Normally I wouldn't post model train stuff on this blog, but this is a great deal if you have model trains and would like to make them better. Railflyer Model Prototypes is having a 33% off sale all weekend. They're raising funds for more tooling, so they could use a few sales. Go check it out! Pop quiz - look at the signals in the photo above. What signals are displayed, and what is going on? Refer to the Canadian Rail Operating Rules General Description and Location of Fixed Signals for reference. I spent some time in the morning of July 27 near Diamond, just west of Winnipeg. I've been there a lot recently because I like the area. It's wide open so there is little to get between my lens and the train. Also, there is not much car traffic out there. Finally, the train crews have to call the signals approaching Diamond so I hear them on the scanner well before I see them. The first train I saw was CN 112, with CN 8911 on the head end and CN 8814 pushing on the rear. The top photo shows them passing the east-facing signals just east of the CN-CP diamond. Right after the train passed, I ran up to the private crossing to shoot CN 8814 going away. Note the lit red marker lights. About half an hour later, train CN 782 came along. This featured two Dash-8 units, CN 2429 and CN 2432. For this one, I shot from the north side of the tracks for a different perspective. Since it was cloudy, the sun was not an issue. After about another half an hour, a westbound train came, CN 111 featuring CN 8904 and CN 8856 on the head end and IC 2715 as a DPU engine. About an hour later, I headed east on Wilkes Avenue but stumbled across this westbound freight train. Three Dash-9 engines were the power: CN 2650, CN 2503 and CN 2671. But wait... there's more! I also shot an eastbound freight just west of St. James Junction. This one had ex-BC Rail Dash-8 BCOL 4643 leading, with SD75I CN 5792 trailing. Five trains in just over 2 hours was good enough for me!